For a general population of people, there aren’t many things that are more likely to improve health than iodine supplementation. Perhaps only Vitamin D and Parent Essential Oils are in this type of most essential category. Most people (96% according to Dr. Brownstein) are at least somewhat deficient in iodine and 50% are significantly deficient. Iodine is essential to life, essential to hormone activity, essential to detoxification. Everyone’s first health goal should be to bring your iodine levels up to optimum. No iodine assimilates better than Magnascent Iodine. It’s the number one best choice, although virtually all iodine supplements are good. Biochemically speaking, Magnascentscent Iodine is Iodine where the Iodine molecule has the diatomic bond broken and has a high amount of electromagnetic energy associated with it. It is highly bioavailable. During the two to three hour active time (within the human body, diluted in water and consumed) the nascent atom has the ability to directly be utilized by the body without conversion until losing this nascent state over a 2-3 hour time span. During this time span, the body recognizes this Iodine atom as exactly the same atom that the thyroid produces from other forms of Iodine in order to make the T3 and T4 hormones. Magnascent Iodine, is recognized by the body as the same Iodine that is used by the thyroid and other hormone receptors. It is absorbed effortlessly by the body. Magnascent Iodine is unique among all Iodine supplements, because of high usability and assimilability benefits unlike any other form of Iodine — Magnascent Iodine is the most easily assimilated Iodine available today! Other Iodine supplements are comprised of Iodine molecules and Iodine compounds (such as potassium iodide). These types of Iodine are very useful, but not as well assimilated as Magnascent Iodine. Therefore, more of those types of supplements needs to be taken and in some cases, the amount needed causes stress to the body. For its ease of assimilability and effectiveness at lower dosing, Magnascent is well worth its higher cost. Iodine is found in every organ and tissue in the body. It is found in high levels in the thyroid, breast, stomach, saliva, ovaries, liver, lung, heart, and adrenals. Thyroid — Much of the research that has been done on Iodine has been focused on Iodine’s impact on the the body’s metabolism and thyroid health, since Iodine is essential for the formation of thyroid hormones and the thyroid hormones affect every cell of the body. The fact is that the thyroid is the master gland of metabolism. When it is not functioning properly it can affect every aspect of your health, particularly weight, mental outlook, body temperature and energy levels. Breast — Iodine is essential for proper breast structure and health. Research on Iodine and the breast has focused on its importance in avoiding fibrocystic breast disease and breast cancer and relationships between thyroid issues and breast health. Brain and Central Nervous System — Iodine is essential for the development of the brain. Cretinism, a severe form of mental retardation with physical difficulties as well, is caused by severe Iodine deficiency in the mother during pregnancy. It is the best known of the Iodine Deficiency Diseases and is still a problem in much of the world. Many suspect that lesser forms of mental retardation are also caused by Iodine deficiency. Immune System — Iodine is a key player in a potent anti-microbial process that requires a peroxidase, hydrogen peroxide, and a halide (Iodine is the most potent). This anti-microbial process quickly kills bacteria, viruses, fungi, and various other microorganisms. This process has been studied in neutrophils, an abundant type of white blood cell important in the defense of the body against infection. If there is no other available Iodine, then Iodine is sometimes scavenged from thyroid hormones. Stomach — Iodine has been found to be concentrated in the stomach. It is important in the production of stomach acidity, the creation of bowel movements, and its absence often results in the proliferation of candida. Skin — Interestingly, a large percentage of the body’s total Iodine is found in the skin. Moreover, Iodine can be absorbed through the skin. Exactly what the Iodine is doing in the skin and the various factors that affect transdermal absorption are not yet clear. Ovaries — Ovaries concentrate Iodine indicating its importance in reproduction. Iodine uptake varies with sexual activities and is enhanced by estrogens. Lungs — There is a long history of the therapeutic use of Iodine for lung issues. It has been successfully used in asthma, bronchitis, and emphysema. Eyes — Iodine occurs in large quantities in the ciliary body and lachrymal glands of the eye. It has been related to cataract formation and glaucoma, and is seen as useful in treating eye infections. Iodine has been found to be protective against UVB radiation damage to the eyes. Mouth — The salivary gland concentrates Iodine 20 to 100 times serum levels. The function of the Iodine in the saliva is not yet clear, but it is speculated to be for killing or weakening of pathogens in food. Hair — Whether your hair turns gray and falls out or stays a thick mane of vibrant color is dependent on your body having proper levels of thyroid hormones. New ground breaking research has documented that human hair follicles are direct targets of the thyroid hormones which modulate hair biology parameters from cycling to pigmentation. To get your full head of hair back and halt the graying, you must restore your level of thyroid functioning to what it was when your hair was plentiful and colorful. Think about how the wisdom of the body operates. When thyroid output is insufficient (because of a lack of a needed resource such as Iodine), the body will attempt to conserve energy. Conserving energy means restricting energy from nonessential areas, and directing efforts at repair and regeneration to those functions considered more essential. This is why the beauty of your hair and skin are among the first to abandoned when thyroid hormones are insufficient. Also, when thyroid function is low, intestinal absorption and utilization of nutrients is also compromised. There are then not enough raw building materials available to keep the nonessential parts of you at their best. I'd say that Magnascent Iodine has definitely changed my life! I have less brain fog, less depression, more energy, just everything is better. I tell everyone that they should use it and many of my family members have started taking it. I've tried many different types too, and Magnascent is by far the best one. So far I end up giving away a lot of it to get people to try it. I can't help it its just so amazing that everyone should be taking it! Magnascent has been marvelous for me. It's the first time I've had energy in 15 years! Vitamin D - essential for conversion of T4 to T3. Cardio & Brain Helper - contains several botanicals that promote the production and activation of thyroid hormones. Artichoke Root and Leaf and Dandelion Root - also remove toxins from the body. Artichoke Root is found in Liver Boost. Cortisol (if you have high Cortisol, then we highly recommend that you supplement with Fibroblast Growth Factors. These foods: Cabbage, Mustard, Soybeans, Turnips and Millet - all of which have chemicals that diminish thyroid hormone production and conversion. It’s not that you cannot eat these foods, but don’t eat considerable amounts. Activated T4 is called T3. T3 is designed to be used immediately while T4 has been bound to a protein to better survive the trip from the thyroid one of the trillions of cells in the body. The thyroid makes some T3... but most T3 is converted from T4 into T3 in the liver or inside individual cells, after intake into the cell. Ensuring that this conversion takes place is done with optimal nutrition, especially with the helpful nutrients listed above and by avoiding the not helpful nutrients listed above. Whats the difference between Magnascent Iodine and other Iodine products? This charging converts the Iodine into a form that the body can most fully recognize and assimilate. Iodine trichlorite claims to be atomic Iodine, but it's not. A true atomic Iodine is the best kind to bring the thyroid to its optimal function because it supports and saturates the thyroid without any toxic buildup. Every cell in the body contains and utilizes Iodine, but Iodine is concentrated in the glandular system of the body. The thyroid gland contains a higher concentration of Iodine than any other organ. Large amounts of Iodine are also stored in many other areas including the salivary glands, cerebrospinal fluid and the brain,3 gastric mucosa, choroid plexus, breasts, ovaries, and the ciliary body of the eye. In the brain, Iodine concentrates in the substantia nigra, an area of the brain that has been associated with Parkinson’s disease. Iodine is essential for the normal growth and development of children. Severe Iodine deficiency can result in severe mental deficiency and deafness (i.e., cretinism). In addition, spontaneous abortion, as well as delayed physical and intellectual development is associated with Iodine deficiency. Attention deficit/hyperactivity disorder. is one of the very most important supplements because of modern iodine depleted soils! 96% of North Americans are iodine deficient and more than half are seriously deficient — with numerous subtle and not-so-subtle consequences to health. Iodine is essential to energy production, hormone reception and membrane transport (cellular detoxification and nutrient assimilation). In the last 30 years (according to the National Health Nutritional Examination Survey) Iodine levels in both soils and people have decreased by 50%. Iodine deficiency is linked to toxicity, obesity, cognitive impairment, heart disease, psychiatric disorders, and various forms of cancer. For men, iodine deficiency has been linked to prostate cancer. For women, iodine deficiency has been linked to endometriosis, fibrocystic breast disease and breast cancer. Why Exactly is Iodine Essential? Iodine is essential to thyroid hormones that regulate metabolism (conversion of food to energy). Low energy from impaired thyroid function is often just a simple matter of Iodine deficiency that could be totally remedied with iodine supplementation. Iodine is utilized by every hormone receptor in the body. Thus, the absence of sufficient Iodine causes a hormonal dysfunction that can be seen with practically every hormone in the human body. If that weren’t enough, Iodine regulates the movement of nutrients into cells and the expulsion of toxins out of cells. So, to ensure that your body doesn’t retain toxins in its cells and tissues and to ensure that your cells absorb more of the nutrients you eat, iodine supplementation is your first priority. There is a decreased childhood survival rate associated with Iodine deficiency (in fact, studies have shown that neonatal mortality can be decreased by up to 50% when Iodine deficiency is rectified). Learn how to see if your body is iodine deficient with a patch test. Quantity discounts available: 3 to 5 units: 5%, 6 to 8 units: 10%, 9 plus units: 15%. A bottle (1 ounce) of Magnascent Iodine contains 1,100 drops, which, at the maintenance rate of 1 to 3 drops per day, will last a year or more. Most people, however, since they are deficient in Iodine, will want to supplement with Magnascent Iodine at higher (replenishing) rates for a period of time ranging from six months to two years. How much one takes to replenish an Iodine deficient body is dependent on preference or situation. Please, however, work up to higher rates, by starting at only 1 drop per day and increasing the dosage over a few days. Why Magnascent Iodine: Magnascent Iodine is among the most absorbable and instantly useable of any Iodine supplement on earth. It’s atomic form of Iodine is the exact form of Iodine that the body uses. Because the atoms are held apart magnetically is why it is called Magnascent Iodine. Magnascent Iodine is a nascent form of Iodine (non-ionic, non-molecular) — the only consumable Iodine with a patented status. Being in a nascent form means that it is in the form of an atom, and not a molecule or salt compound. Nascent iodine has a major advantage over nutritional, elemental or other forms of iodine such as Lugol's solution. This advantage is in regard to the physical phenomenon of diffusion. A vast majority of the body's iodine is stored in the thyroid, in iodide form (the thyroid is built to trap iodide) and, as such, the iodide ion has a steep gradient to overcome for diffusion to occur. While the body is well designed to fight this gradient, the simple fact is that nascent iodine is not affected by it. Thus, nascent iodine diffuses readily and easily into the tissues, including the thyroid without input of additional energy or mechanisms by the body to do so. This increases the speed with which nascent iodine acts within the body. A major use of Iodine in the human body is in making Thyroxin (T4), the metabolic hormone that instructs cellular mitochondria to convert food to energy. Energy production is one of the most important aspects to human health, productivity and happiness. Thyroxin is produced in a very complex way. When the blood's thyroxin level is low, the brain's hypothalamus (the gland that is the energy super-brain orchestrating the body’s complex energy functions) produces a thyrotropin-releasing hormone. Thyrotropin-releasing hormone stimulates the pituitary gland to produce thyrotropin - thyrotropin is a thyroid-stimulating hormone (TSH) that excites the thyroid gland to produce thyroxin (T4). When the blood's thyroxin level is high, the hypothalamus releases a hormone that inhibits TSH production. Without adequate amounts of Iodine in the body, this complex procedure fails at the point of making thyroxin. That means that low iodine levels could be the result of fat gain and lower metabolism - all resulting due to not enough thyroxine being made in the body. 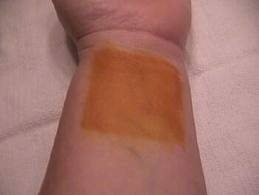 So, do a patch test and find out where your iodine levels are. In the past 30 years, soil levels of Iodine in many areas have dropped by 50% and today, most of the world’s soils and crops are deficient in Iodine. It is estimated that 74% of the world’s population are now deficient in Iodine, which is at least partly responsible for the current epidemic of overweight issues and tiredness. Iodine is very important to protect against chlorine, bromine and flourine interference with cell membrane functions, which interfere with hormone release, nutrient uptake and toxin removal. If your water is fluoridated, you had better keep your iodine levels high. If you eat bakery goods (common source of bromine), you had better keep your iodine intake high. Otherwise, these halogens will take over in iodine receptors, blocking hormone and nutrient transport and trapping toxins in cells. Radiation quickly damages the thyroid. With the amount of increased radiation in the environment (from Fukashima, etc. ), the threat of thyroid cancer is one of the fastest growing cancer threats today (especially in children). Nascent iodine can help protect the thyroid by competing with radioactive iodine in thyroid receptors. Start with a lose dose of Magnascent Iodine of only 1 to 3 drops daily. Don’t be in a hurry to increase your iodine dosing. Iodine can dramatically change how cells intake nutrients and expel toxins, so you can create a cleansing crisis if you increase your dose quickly. The reason for going slow is that Iodine helps cell membranes to have an increased ability to expel toxins from the cell into the bloodstream, and intake nutrients and respond to hormone messengers. If you increase your dosing of Magnascent Iodine rapidly, you may unleash enough exiting toxins to make you grumpy or very uncomfortable. Also, you can put cellular processes into high gear... that may result in you being awake in the middle of the night. So, go slow!!! One to three drops a day is the label recommendation for Iodine maintenance for most people because most people use up between 1 to 1.5 mg of Iodine each day. Each drop of our 2% Magnascent Iodine contains .315 mg of Iodine. Going from an iodine deficient state (which is the case for most people) to a state of having optimal levels of iodine in the body requires much more iodine to be consumed. Also, if one body contains bromine and fluorine, much more Iodine needs to be consumed in order for the Fluroine and Bromine to be replaced by the Iodine and the Fluorine and Bromine to be expelled. For most people, an increased rate of detoxification causes no problems, but, for some people, a rapid change in how many toxins are leaving cells and entering the blood stream is very uncomfortable, especially if their elimination pathways are sluggish, or they are extremely toxic. Hence the suggestion we make is to start at a very low dose, and increase from there, always staying in your comfort zone. Maximum doses can be as high as 60 drops per day (in severely deficient situations) in divided doses (but, again start from a lower amount and work up). First determine your Iodine saturation goal for your body. For most adults that number will be between 2,000 mg and 3,000 mg total Iodine storage in the body. You can multiply your body weight in pounds by 14. So, for a person who weighs 150 pounds, the total desired amount is 2,100 mg.
Next, keep in mind that your body loses about 1 mg per day of Iodine in the normal course of living. So, if you want to bring your Iodine storage level (or saturation) up to 100% in twelve months time, you will need to add 365 to 1,743 (=2,108). The 365 is to replace the 1 mg loss per day during those twelve months. Next convert milligrams to drops and divide by number of days. There are .315 mg of Iodine in each drop. So, divide 2,108 by .315 and you will need to take 6,692 drops over that twelve month period, which is 18 drops per day... and you 5 drops four times a day, or 9 drops twice a day. The above does not take into account any Bromine or Fluorine in the body which will drastically increase one's need for Iodine (to also flush out the Bromine and Fluorine). Many people simply multiply the dosage by two to compensate for the proability that Bromine and Fluorine are in the body.Thus 18 drops a day would become 36 drops a day. Similarly, maintenance doses for someone using fluoridated water and toothpaste with fluoride would be doubled. However, please start at a very low dosage initially (1 drop once a day for a few days). After that, go to 1 drop twice a day for a few dayss. After that go to two drops twice a day and slow increase the dosage from there until reaching the target dosage (increasing slowly enough that you never experience discomfort). Many people wonder why such a low supplementation dosage to start with. The reason is your comfort. It’s kind of the same reasoning you would use to not start running 10 miles your first day of exercise. That would give you very sore muscles (i.e. you would experience discomfort). Similarly, we suggest that you don’t take a large amount of iodine the first few weeks... since that might cause a lot of toxins to release and make you uncomfortable. And always, keep in mind that our recommendations are for a general population of people. You are unique, and, if you have any doubts about doing this, talk to your doctor. Every one is unique. So, even though, iodine is required to live and even though most people are deficient, the only way to be absolutely sure that you aren't ingesting more iodine than your body needs is to be tested by a doctor who is knowledgeable in iodine issues. In general, however, go slow, stay within within reasonable amounts as suggested here (1 to 3 drops per day maximum long term dosage). Replenishing dosages, of course, can be higher. Please keep in mind that Dr. Brownstein, who has extensively researched Iodine in regard to human health recommends 50 mg to 60 mg of standard Iodine supplements daily for a year to correct Iodine deficiency. To the extent possible with your daily schedule, for efficient use of Magnascent Iodine, we recommend that you divide your dosage of Iodine into several (two to five) doses per day, rather than just one large dose. This is because the body uses it for a period of two to three hours before it loses the nascent state; therefore, dividing up the amount gives it a longer time to be active in the body. Please note that many people find it useful to swish the solution around in the mouth before swallowing to because of its natural antiseptic properties (helps prevent tooth decay and bad breath). We recommend not taking Magnascent Iodine just before going to bed, as Magnascent Iodine is totally active and will accelerate many processes, which may keep you awake. A quick way to get a rough idea whether or not one is deficient in Iodine is to paint (using liquid Iodine) a 2 to 3 inch circle or square onto your skin and then observe how rapidly the body absorbs the Iodine from the skin. If the body is extremely deficient in Iodine then the Iodine stain will disappear in less than 8 hours. If the stain is still there in 48 hours, then the body probably has enough Iodine. Iodine will disappear more rapidly from the skin in hot temperatures and at higher elevations. So, it is an imprecise test. Therefore, keep in mind that there is a much, more precise test that can be administered by medical staff that involves consuming 50 mg dose of Iodine and measuring the amount of Iodine that is retained by the body versus excreted in the urine. Keep in mind, that even if one is not deficient in Iodine, one's body might likely contain bromine and fluorine and chlorine. In this case, Iodine supplementation may still be VERY valuable to help remove bromide, chlorine and flouride from the body through the urine. We do not offer recommendations as to amounts of Iodine to be used for the treatment of various health conditions. 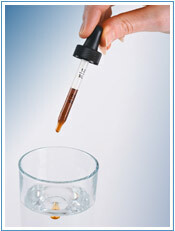 Please consult with a licensed medical caregiver, who is knowledgeable about Iodine in that regard. Our Iodine starts as a tincture with the Iodine in molecular form — I2. But, after going through our patent pending magnetic field for a long period of time, it converts to its nascent state, which is atoms of Iodine. The discovery of a consumable form of nascent Iodine is a very recent development. Nascent Iodine is well known in the scientific and medical communities, but not in a consumable form. There are at least three patents in the marketplace which reference using nascent Iodine in various ways, but not as a consumable product. Our patent, now approved, is the first patent for a consumable form of nascent Iodine. These non-consumable forms of nascent Iodine have very short life span and have very limited uses. One process produces nascent Iodine in an electrolytic bath for coating pacemakers, catheters, and other devices that enter the human body. The nascent Iodine is produced in the electrolytic bath and coats the device to completely sterilize it. The other two patents involve producing nascent Iodine for transdermal application by mixing chemicals to produce nascent Iodine. These are very short-lived, as well, in their process. They produce nascent Iodine for application on the skin. Our product, Magnascent Iodine, is a consumable form of nascent Iodine and is not produced chemically or electrolytically. For this reason, our product has a long shelf life and can be taken internally to provide nascent Iodine to the body. Over 100 years ago, those who worked with Iodine were searching for a method for producing nascent Iodine within the body, and they went to extreme measures to attempt this. The history of our discovery and the patenting of our process began with a desire to help combat malaria in Southern Africa. In the year 2000, John Brookshire, an aerospace engineer with an passionate interest holistic healing, met a missionary struggling with the devastating effects of malaria and the inability of current treatments to combat malaria. A search of holistic treatments from the 1930’s revealed a type of Iodine used to treat various illnesses, including malaria. The exact formulation of this medicine from the 1930’s appears to have been lost as the parent manufacturing company was bought and sold many times within a few years. A second method for producing this Iodine had been recommended at the time, but was far too costly and time-consuming to be produced in the depression era of the 1930’s. In June of 2005, nascent Iodine was produced for the first time since the 1930’s. The missionary and his family decided to try this Iodine supplement and found it effective against malaria. They had already been using a non-nascent Iodine supplement, an energized Iodine which was effective in helping health situations in Africa. After the first use of this new Iodine in the nascent state, the missionary excitedly reported, “This product is amazing! Just amazing!”. That seemed to be the only word that he could use in describing our product. Iodine has consistently provided the most satisfying clinical results as compared to any other nutrient. Iodine is also effective for treating fibrocystic breasts and ovarian cysts. Table 1 lists some of the many benefits of Iodine and some of the conditions that would benefit from adequate Iodine supplementation. Dr. Guy Abraham, developed the Iodine loading test... it is done by ingesting 50 mg of Iodine and collecting 24 hours of urine. By measuring the amount of Iodine excreted in the urine, you can ascertain the Iodine status of the body. Research has shown that Iodine sufficient people have approximately a 90 percent excretion. Therefore, if they ingested 50 mg of Iodine in 24 hours they will excrete approximately 45 mg and retain 5 mg. The more lack of Iodine in the body, generally the lower the excretion rate. In essence, if one is very ill, their body will be calling for more Iodine and they will excrete less during the loading test. In this case, they will retain a large portion of the loading test and their excretion rate will be lower than 90 percent. However, 50 mg/day of Iodine in an individual ill with a serious illness such as cancer or an autoimmune disorder may be insufficient to meet their needs. My clinical and laboratory experience has shown that ill individuals generally need more Iodine as compared to healthy individuals. At 25-50 mg/day of Iodine, it may take years for an ill individual to become Iodine sufficient... the best results are found by using Iodine as part of a comprehensive holistic regimen that includes balancing vitamins, minerals, and hormones. Remember, the best results are achieved when working with a skilled health care practitioner who is knowledgeable about Iodine. More information about Iodine can be found in my book, Iodine Why You Need It, Why You Can’t Live Without It, available here. Manner, M.G., et al. Salt Iodization for the Elimination of Iodine Deficiency. International Council for the Control of Iodine Deficiency Disorders. 1995. Modern Nutrition in Health and Disease, 9th Edition. Williams and Wilkins, 1999.